Don't make your audience victims of death by PowerPoint any longer. Take a look at these highly effective and recommended alternatives to using PowerPoint for creating presentations. Ready to try something different? Tired of those same old Powerpoint and Keynote templates? Try Emaze, an online presentation software. Emaze is the next generation of online presentations, empowering you to create an amazing impression through design and technology. 2) Videolicious- This FREE tool is very user friendly and great for taking pictures to tell stories. This is available in the APP for version as well as a website. 3) Google Presentations- This FREE tools is simple to use to make quality presentations that can be shared out with the whole class. Google's interactive features allow you to collaborate, as well as add graphics, pictures, colors, fonts.. the list goes on. 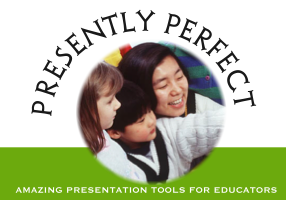 Create a presentation, or have students create the together. 4) Educreations- This FREE app and website, allows you to make cool presentations using an interactive whiteboard format on the app. You can use text (keyboard) to type, or write directly on the whiteboard with their finger or a stylus using various forms of ink (crayon, pencil, marker, etc..) They can insert photos, and draw images directly on the app. You can record yourself talking on the app. This is great for teaching a lesson in the flip classroom format. Use it to teach a unit, and share it to the Educreations community site. 5) Voicethread This FREE app and website is great for creating digital stories, or interactive presentations. Have a class discussion by commenting, or writing directly on the slides. Create a presentation using video, photos, or text. 6) Present.me Record a lesson on Present.me, students can watch in their own time, over and over again if they need – leaving you extra time in class for more interactive work. View your image on one side of the viewer, and display your slide presentation on the other side. 7) Tellagami a mobile app that lets you create and share a quick presentations. Create easy tutorials, or animated anticipatory sets to introduce a unit or lesson animated Gami video. A FREE tool with super cool graphics. Create animated presentations and videos as easy as PowerPoint, but way cooler! 9) Slideshare - Share what you know and love through presentations, infographics, documents, and more. No more worries about your presentation being to large to share via email. 10) PhotoPeach -With PhotoPeach you can create a rich slideshow in seconds to engage your friends or family. We also support background music, captions, and comments so you can elaborate on your story further.